Aimed at kids aged 4 through 8, this is the 11th installment in the Brady Brady hockey series (2 baseball and 1 football titles also exist). I love the beautifully illustrated glossy pages, certain to capture the imagination of any youth. The stories are always entertaining, and more importantly possess a positive moral. 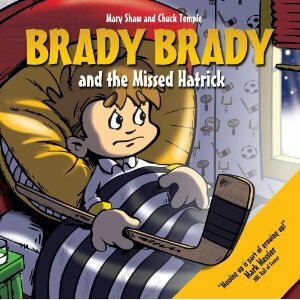 In "The Missed Hatrick" Brady's love for playing street hockey with his friends starts to create some problems, as he is so single-focused on rushing off to his hockey games that he forgets to do his chores and to help his mom and dad. But Brady gets the lesson of a life time when he absent-mindedly leaves his best pal - pet dog Hatrick - tied to a lamp post in winter storm, somehow forgetting all about him in his rush to sneak back from the game he was not supposed to be at in the first place. Things getting even worse when the family returns and Hatrick is nowhere to be found. Of course Brady and Hatrick are reunited, thanks to the kind man at the animal shelter who rescued the dog from the winter storm. But it is a great little story about what is really important in life. There's a neat little quote on the cover of the book by NHL superstar Mark Messier: "Messing up is part of growing up." I'm already looking forward to seeing how our friend Brady manages to find new ways to mess up in future titles. Definitely give any of the Brady Brady series consideration if you are looking to get the child in your life a book or two for Christmas this year.